On 25 April BHS went into administration. It was just over a year since the 88-year-old retailer had been sold by Sir Philip Green to a consortium of unknown investors for £1. The collapse of the company into administration has led to questions about the way it was managed and whether its demise was inevitable. There has also been a close examination of where all the money has gone in the 15 years since Sir Philip bought it for £200m in 2000. Much attention in the wake of BHS falling into administration has been on its pension deficit of £571m. But the deficit that would need to be wiped out if BHS was still trading is calculated differently and is nearer £350m. In 2013 BHS agreed to put £9.5m into the pension pot every year for 23 years to fill the hole. Companies have a legal obligation to do this under the Pensions Act 2004. Critics say this wasn't enough cash and it would take far too long. 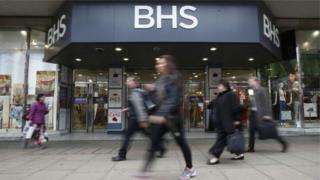 The deal was agreed between the trustees of the pension scheme and BHS. The Pensions Regulator supervised the process to make sure any agreement was credible. It doesn't have to approve each agreement, though. This was an unusually long-term plan. It is more common for them to run over 10 to 15 years. Although the Pensions Regulator won't comment on BHS specifically, it said the financial viability of a company is often taken into account. It may have been concerned that getting BHS to pay in more, to wipe out the deficit faster, would put too much strain on the company's finances. BHS lost an average of about £70m a year between 2008 and 2014. Why did it have this deficit in the first place? As recently as 2008 it didn't. The BHS pension scheme was closed to new members in 2005 and the deficit shrank from £74.7m that year until it had a £3.4m surplus in March 2008. Things have got a lot worse since then. The BHS scheme had almost half of its assets in the stock market. After the financial crisis share prices fell. Returns on a number of investments have been poor since then and this has made life difficult for pension schemes. In 2008, BHS said the pension fund expected a long-term return of 8.5% on stocks and shares, where most of its money was. The expected rate of return on all assets has tumbled since then. It was cut from 6% to 3% in 2014. Because of the way pension accounting works, poor returns in financial markets also increase the expected cost of a pension schemes liabilities, or what it has to pay out. For BHS they rose from £428.8m in 2008 to £645.5m in 2014. So the money the scheme made on its investments was a lot lower than hoped, and the expected cost of paying all those final salary pensions has increased. A huge deficit is the inevitable result. Sir Philip bought BHS in March 2000. In December 2001 it sold 12 stores to Carmen Properties Limited for £105.9m. It then rented them back from the Jersey-based company for about £12m a year. Carmen Properties had the same owners as BHS - Sir Philip Green and his immediate family. Over the next 11 years it was paid £141m in rent by BHS. Some property experts suggested the rents looked high, compared to the going rate at the time, but Paul Budge, finance director of Sir Philip's retail empire Arcadia Group, has said the amount the Greens received was close to the going rate if you take certain costs into account. One of the most eye-catching figures to emerge since the collapse of BHS was the total dividends it paid - £414m over four years. It is likely more than £400m of this went to Sir Philip Green and his immediate family as the owners of BHS. In 2004 alone the company paid out £220m. That was £118m more than its pre-tax profits. The payment wiped out £147.7m of reserves held in BHS, at a time when the pension fund had slipped into a sizeable deficit. About another £60m of reserves went on dividends - as well as all the company's profits - in the first three years of Sir Philip's ownership. Overall the payment of dividends reduced shareholder funds, essentially the amount of money in BHS, from £335.2m to £86m between 2000 and 2004. BHS was sold to Retail Acquisitions for £1 on 12 March 2015. Dominic Chappell, its new owner, has twice between declared bankrupt and had millions of pounds of debts after a failed enterprise to build a marina on the Isle of Wight. There are questions over whether Mr Chappell, a former racing driver with no retail experience, was the right person to take over the High Street chain. Sir Philip Green has suggested the new management crashed the 88-year-old retailer into a proverbial mountain. Mr Chappell has claimed other people made turning BHS around impossible. Sales were actually quite good in the year before it was sold. Arcadia Group's 2014 results show like-for-like sales were up 3.6% at BHS, much better than the group as a whole. Yet retail experts tend to agree BHS had fallen behind its competitors. The number of clothing shoppers coming through its doors, and its share of clothing sales, on the High Street were falling. "Even to its core audience, BHS had become something of an irrelevance," Neil Saunders, chief executive of retail analysts Conlumino said when it filed for administration on 25 April.